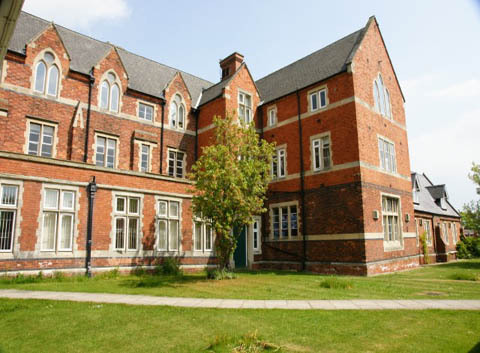 Bishop Grosseteste University was founded in 1862 as a training college for school mistresses and at the time was known as Lincoln Diocesan Training College. It was renamed Bishop Grosseteste College, after 13th-century Bishop of Lincoln Robert Grosseteste, in 1962 on the occasion of its centenary. The name was changed again, to Bishop Grosseteste University College, in 2007 when the institution was granted degree-awarding powers, and more recently in 2012, to Bishop Grosseteste University, when the institution was granted University status. Records and documents pertaining to BGU's long history are kept in the University Archive which is located within the Library and is maintained by University Archivist, Guenever Moyes. Access to the Archive is by appointment only; please contact Guenever to arrange a visit. The Wellbeing Collection was launched in January 2018 in conjunction with a University-wide initiative to promote physical and mental wellbeing. It is made up of a variety self-help books, feel-good fiction and feel-good films. Items in the Collection aren't kept together in the Library, but each displays a 'Wellbeing Collection' sticker. Click here for a list of the titles. The same list is available to view below as a PDF and includes the shelfmark for each item. If you have a suggestion for a new addition to the Collection please email us at library@bishopg.ac.uk. A selection of sheet maps is kept in the map cabinets on the ground floor adjacent to the University Archive. The majority focus on Lincolnshire with a small selection covering neighbouring counties. Dates range from 1845 to 1998 and features include settlement, administrative boundaries, land use, geology and elevation. 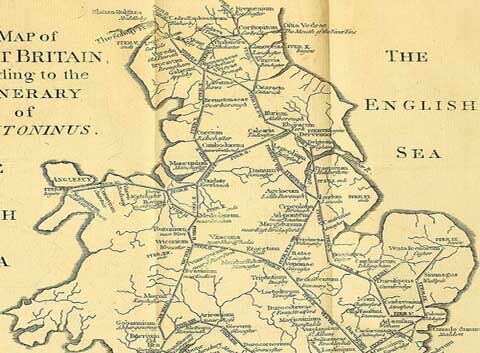 Also located in the map cabinets is an almost complete collection of sheet maps of the reprints of the one-inch Ordnance Survey map of England and Wales, originally surveyed and printed in the mid to late nineteenth century. Sheet maps are listed in the folder kept by the map cabinets. They are not recorded on WorldCat. All are for reference only and must not be removed from the Library. A further selection of folded maps relating to Lincolnshire, including OS Explorer maps, are kept in the Lincolnshire Collection. They are arranged by shelfmark and are integrated with the bookstock. These maps can be searched on WorldCat and the majority can be borrowed. Located close to the Library entrance, the Teaching Resources Collection (TRC) is home to around 24,000 resources for primary and secondary trainee teachers, students working or intending to work in educational settings, and students of children's literature, although all BGU students are welcome to make use of the space and resources. The Collection has been developed over many decades and we are proud to be able to say that it is one of the best of its kind in the country. 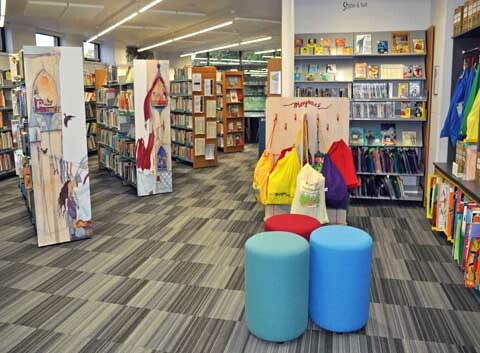 The space is split into two areas - teachers' resources on the left and children's resources on the right - with the overall design intended to facilitate browsing, quiet study and group discussion. Our collection of Children's Resources include picture books, fiction and non-fiction books, big books (fiction and non-fiction), dual language books, feature films, audio books, resource packs, artefact boxes, novelty books, puppets, Storysacks® and journals. At its heart is an extensive collection of classic and contemporary children's literature. All major authors and illustrators are represented, demonstrating the development of children's literature over many decades. Though the emphasis is on British literature there is a good selection of American fiction, world fiction and books translated into English from other languages. Poetry books and fairy tales also feature. Our collection of Teachers' Resources supports teachers and trainee teachers in developing lesson plans and teaching strategies to implement the National Curriculum. The collection includes National Curriculum documents, government reports, reading and phonic schemes, educational textbooks, teaching handbooks and lesson planning guides. All of the teachers' resources are for reference only, allowing students to compare and contrast different educational materials. 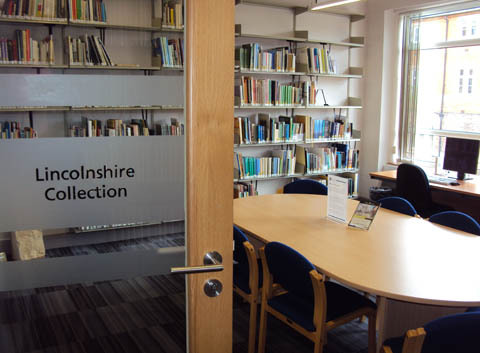 The Lincolnshire Collection can be found on the first floor of the Library and comprises approximately 4,000 items including books on Lincolnshire history, archaeology, flora and fauna, geology, trade and industry, language, heritage and architecture. The collection also incorporates a number of publications by the Lincoln Record Society including wills; diocesan documents and diaries; directories and village histories; the books and papers of Tom Baker (1911-1998), former Lincoln City Librarian and noted local historian; and, most recently, the library of the Society for Lincolnshire History and Archaeology which was donated to the University in 2013. The Lincolnshire Collection incorporates loan and reference books. A small number of items from the Lincolnshire Collection are kept in a closed access store due to their fragility. All items in the Collection are searchable via WorldCat. The Lincoln Mystery Plays Archive (incorporating the Keith Ramsay Collection) was donated to Bishop Grosseteste University by The Lincoln Mystery Plays Trust in July 2014. Mystery plays focus on biblical stories. Popular in medieval Europe, they were often performed in ‘cycles’, with performances spread over several days. The N-Town cycle, upon which the modern Lincoln Mystery Plays are based, includes 42 plays believed to have been written and first performed in the late fifteenth century in the East Midlands or East Anglia. The first ‘modern’ mystery play known to have been performed in Lincoln was staged at The Theatre Royal in 1969. In 1978 The Lincoln Mystery Plays Company was formed by Keith Ramsey, then a Senior Drama Lecturer at what was then Bishop Grosseteste College, and productions have been staged on a regular basis ever since, usually every four years. Keith Ramsey directed the Lincoln Mystery Plays until his retirement in 2000. Made up of ephemera from a variety of performances in Lincoln Cathedral, Southwell Minster and overseas, the Lincoln Mystery Plays Archive incorporates more than 500 photographs, 130 press releases and reviews and 50 items of correspondence, as well as programmes, scripts, working scripts, posters, DVDs of productions, television reports & interviews, music CDs, reference books and Keith Ramsay’s personal scrapbooks. It is potentially of use to students and researchers of medieval drama, community theatre, site-specific drama, religious drama and theatre production, as well as anyone involved in the staging of mystery plays. Compiled by the Imperial War Graves Commission this document records the names of civilians who died from enemy action during World War II (1939-45). It covers the UK as well as deaths abroad, including civilian deaths in prison camps and deaths at sea (shipping and aircraft). The record gives details of 66,375 fatalities which are arranged by county, subdivided by local government area, and then ordered alphabetically by surname. Some records have more details than others, but generally give a residential address, place of death and, where possible, family relationships. Deaths at sea are recorded under the names of the ships concerned, unless they are the result of an air crash. Deaths abroad are listed by country. The document is kept as loose leaves in five boxes and may be consulted in the University Archive Search Room by appointment. Also included in this collection is the 2014 official brochure (with the order of service) commemorating the 70th anniversary of D-Day, produced by the Ministry of Defence with the assistance of The Royal British Legion and the CWGC. Stored in three boxes the annual accounts may be consulted in the University Archive Search Room by appointment . The Great War: The Standard History of the All-Europe (Later All-World) Conflict: Volumes 1-13. Published in London by the Amalgamated Press Limited, these illustrated volumes were produced throughout World War I, starting with volume 1 in 1914 and ending with volume 13 in 1919, and as such offer a contemporary view of the conflict as it progressed. The volumes may be consulted in University Archive Search Room by appointment. 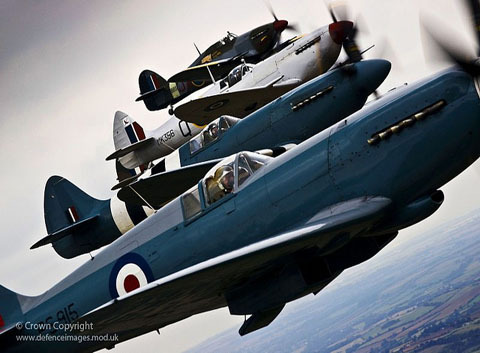 Planes: Spitfires and Hurricanes Flying in Formation Over Lincolnshire by The MInistry of Defence on Flickr under a CC BY-NC-ND 2.0 Creative Commons Licence. Map: Image from page 566 of "The history of Great Britain : from the first invasion of it by the Romans under Julius Cæsar. Written on a new plan" (1789) by Internet Archive Book Images on Flickr; no known copyright restrictions. Photographs of the University ©Bishop Grosseteste University. LMPT Archive logo courtesy of the Lincolnshire Mystery Plays Trust.